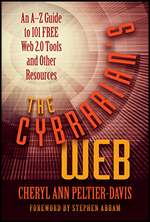 Finally I can announce the completion of the second volume of The Cybrarian's Web 2 (TCW2). Similar in purpose, organization, and content to the first version, TCW2 provides in-depth summaries and analysis of free resources on the web and the practical application and implementation of these resources in libraries and other work environments. While the first volume was written as a starter guide to social media tools, catering mainly to the needs of an audience with limited technological knowledge (for example, brief overviews and library use of popular tools such as Blogger, Delicious, Facebook, Twitter, Wikipedia and YouTube), TCW2 focuses on lesser-known tools successfully implemented by libraries. Another major divergence is the extensive coverage given to ebooks, ebook collection and ebook readers. Available soon from Information Today Inc.